Fans may know native New Orleanian Paul Sanchez as a founding member of the rock band Cowboy Mouth, with whom he has 11 albums; for his role in the HBO series TREME where he played himself; or as the creative force behind the musical NINE LIVES, a musical adaptation of the best-selling novel by Dan Baum. NINE LIVES follows the lives of nine people in New Orleans from 1965 (the year Hurricane Betsy ravaged the city) through 2005 (the year of Hurricane Katrina) and beyond. Paul Sanchez transforms audiences with his unique blend of music and storytelling – at once powerful, sad, humorous, entertaining, and hopeful. Like many New Orleanians, Paul was tremendously impacted by Hurricane Katrina, having lost his home. “I lost my home, my possessions, community and, eventually, my job after the flood. I was changed, am changed as a person and it couldn't help but change my music", confesses Sanchez, who like many struggled to find a new identity after Hurricane Katrina. After much soul-searching, he left Cowboy Mouth to go solo. Paul Sanchez began writing songs and playing his first professional shows in the French Quarter before he turned sixteen. By the 1980’s, Paul was an established part of the New Orleans rock scene, playing in The Backbeats along with Vance DeGeneres, another native New Orleanian. He lived in New York City in the late 80's and was part of the now legendary Anti-Folk scene in the East Village. 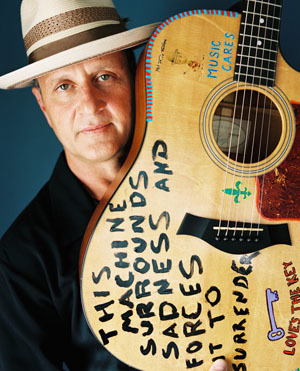 In January of this year Off Beat Magazine awarded Paul Songwriter of the Year 2014, he won three Best of The Beat Awards n 2010: Songwriter of The Year, Best Song of The Year, Best Folk/Rock Album for Stew Called New Orleans, his duet record with friend and collaborator John Boutte. In April of that same year Gambit Weekly awarded him Best Roots Rock Performer at The Big Easy Awards. Primarily a songwriter Sanchez has written songs for Darius Rucker of Hootie and The Blowfish, had a song in the country charts which was recorded by The Eli Young Band, and a song covered by Irma Thomas, the Soul Queen of New Orleans. Paul resides in the Treme neighborhood, where he sings and breathes everything New Orleans.